One of the commoner substances used for home henges is soap. (It doesn’t rival cheese, but that’s a subject for a time when we’re less hungry.) 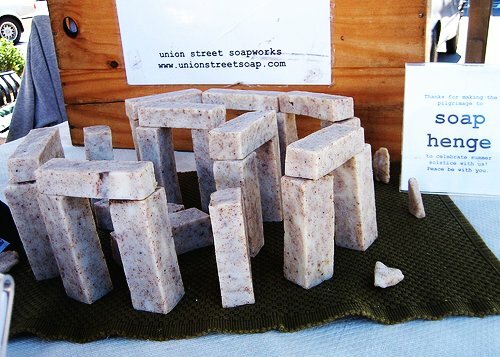 The sign on this example says, “Thanks for making the pilgrimage to soaphenge to celebrate summer solstice with us! Peace be with you.” We checked the website of this soap company, but this display seems to have been the whim of the moment rather than a company policy. No sign of Stonehenge on that site. We will post more good soaphenges if they’re offered. It’s hardly fair to score this, since it seems to have been off the cuff. Taking into account the little soap chips for stones and the fallen uprights, we’ll give it six druids for demonstrating the spirit of Clonehenge–how people just can’t resist building a trilithon!